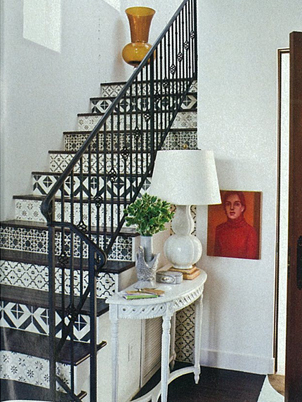 A staircase can remain covered in paint, carpet or runners for years. A mere conduit to go from one floor to another. Yet you may be harbouring a sleeping beauty, particularly if you are fortunate to have a wooden staircase from Georgian, Regency or Victorian times. This can be restored to become the major feature of your property. A showpiece to display to the family, staff, customers and guests. These older staircases tend to have many layers of paint which need to be stripped away - particularly from the treads and risers. This removal is the first part of the renovation process before sanding is carried out. Although this work is painstaking and labour intensive, the results more than justify the effort. So it’s essential to choose an experienced wood floor sanding and restoration company to undertake such a skilled and important job. finish with lacquer in much the same way as we would a floor. is covered by a carpet. * sanding and coating the entire tread and risers - leaving the wood exposed. * combining sanded and lacquered treads with painted risers, with the skirting or 'stringer' of the staircase also remaining painted. This can provide a most striking effect; for example, with white risers contrasting with the dark lacquer of the treads. We usually begin by using a heat gun to melt and blister the thick paint from the stair treads and risers - followed by scraping by hand. Once the paint has been stripped, we remove as many nails as possible, punch in any others - and fill in the holes. We also remove all beading and stair edge caps. The next stage is to use a liquid chemical stripper and wire wool. We then sand the staircase to a very fine finish with various grades of sandpaper. 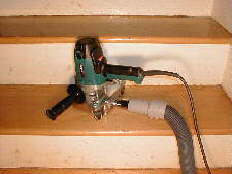 Once the staircase is fully sanded, it may be stained to change the colour. The final finish is at least three coats of lacquer, key-sanding between each coat, for better adhesion and a finer end result. optics or recessed LED lights. Ask us to discuss the creative possibilities for your property. We’ve restored a large diverse variety of staircases in every kind of setting. We can give you lots of ideas from the most traditional - to the unconventional and bespoke. Call us today for your free assessment. Your floor can realise its full potential; impress your guests - and add value to your property.